A National Council drawn from eight federal agencies signed on Thursday to shape the Obama Administration’s new 21st Century Conservation Service Corps, 21CSC, a jobs program to put youth and returning veterans to work protecting and restoring public lands, waterways and cultural sites. The 21CSC implements the first recommendation of the America’s Great Outdoors Initiative introduced by President Barack Obama in 2010. “The 21st Century Conservation Service Corps will help prepare the leaders of the future by providing youth with valuable opportunities for recreation, career development and service to their community and their nation,” Sutley said. Secretary of the Interior Ken Salazar said 21CSC follows the example set by the Civilian Conservation Corps created by President Franklin Delano Roosevelt to put Americans to work during the 1930s. “Building on the legacy of President Roosevelt’s Civilian Conservation Corps during the Great Depression in the 1930s, the 21st Century Conservation Service Corps will help build and train a workforce who fully represent the diversity of America while creating the next generation of environmental stewards and improving the condition of our public lands,” Salazar said. 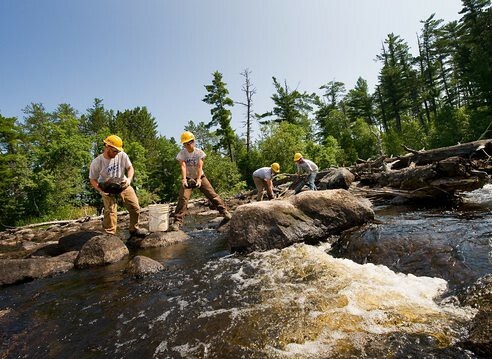 The 21CSC builds on existing partnerships with youth conservation corps across the country to engage thousands of young Americans – including diverse low-income, underserved and at-risk youth – in hands-on service and job training experiences on public lands and community green spaces. The National Council will stimulate “existing and new public-private partnerships” and “align the investment of current federal government resources,” the agency leaders said in a statement announcing establishment of the council. The National Council will consist of members of the senior leadership of each agency, bureau or office that signed the Memorandum of Understanding Thursday: the departments of the Interior, Agriculture, Commerce, and Labor, as well as the EPA, the President’s Council on Environmental Quality, the Corporation for National and Community Service, and the U.S. Army Corps of Engineers. Goals of the 21CSC include reducing the impacts of climate change on our natural resources, empowering Native American communities, building trails, enhancing wildlife habitat, and improving and restoring cultural and historic landmarks. 21CSC has already begun to work, under the leadership of the departments of interior and agriculture with the participation of the U.S. EPA. Youth members helped run shelters and restore parks and beaches in New York City after Hurricane Sandy. Youth and veterans are building trails and leading interpretation programs in remote national parks, forests and coastal areas.